Renmore’s 38th annual pantomime ‘Little Red Riding Hood’ featured a new script by Panto Dame, Peter Kennedy, that brought the traditional story to life with a few novel twists. The production was directed by award-winning twins Brian & Seán Power. 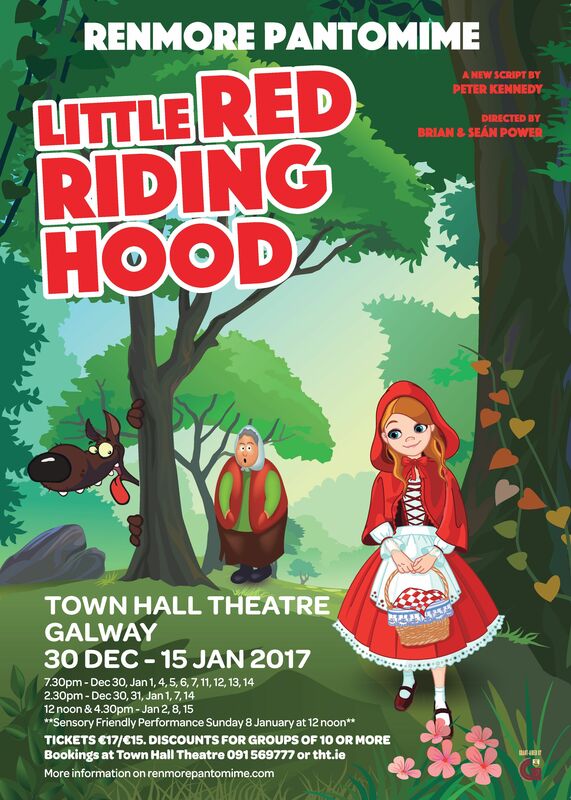 The Panto ran for 21 performances at the Town Hall Theatre, Galway from Friday 30th December to Sunday 15th January with show times on different days at 12 noon, 2.30pm, 4.30pm & 7.30pm. There was a Sensory Friendly Performance on Sunday 8th Jan at 12 noon. The Panto played to packed houses (7,500) and several performances were booked out in advance. To see SUMMARY & CHARACTERS for Little Red Riding Hood … Click Characters. To see Preview Photos click PHOTOS.